A University of Valparaíso, Chile, Resident of Anesthesiology and Resuscitation. B University of Valparaíso, Chile, Carlos Van Buren Hospital, Chief of Anesthesiology and Resuscitation. Pediatric anesthesiologist. C University of Valparaíso, Chile, School of Medicine, Undergraduate Medicine Student. D University of Valparaíso, Chile, Carlos Van Buren Hospital, Valparaíso, Chile, Head of the Pediatric Critical Care Unit. Pediatric Intensivist Doctor. E Carlos Van Buren Hospital, Valparaíso, Chile, Neuroradiologist. Since its introduction in 1986, propofol has beco me one of the drugs frequently used in surgical procedures and sedation of critically ill patients1. In cases of refractory epileptic status in adult and pediatric pa tients, it is used as a third-line drug by some experien ced health centers2,3. Propofol Infusion Syndrome (PRIS) is a rare con dition, often diagnosed by a discard process, with va riable clinical manifestations, being metabolic acidosis the most frequent among them. The factors that most influence mortality are the cumulative dose of the drug, the presence of fever and craniocerebral trauma4. Due to the wide range of manifestations of the syn drome, it becomes very important to consider it within the differential diagnoses of patients with metabolic acidosis, since early diagnosis and intervention can prevent a fatal outcome. In this context, the case of a 6-year-old patient with diagnosis of refractory epileptic status is discussed, who received sedation with propofol and developed lactic acidosis associated to the use of this drug. 6-Year-old female patient with history of cerebral cortical dysplasia with neuronal migration disorder and right hemisphere sulci malformation, secondary epilepsy, scoliosis, and mild-moderate intellectual di sability, treated with valproic acid, levetiracetam, and clonazepam. In September 2016, she presented an automatism crisis (blinking type), associated with periods of increased muscle tone of the upper limbs and disconnection from reality. After multiple consultations, she was ad mitted on October 13 and treated with midazolam and levetiracetam. The patient persisted with more than 30 crises per day and was transferred to a tertiary health care center with consciousness compromise, she was admitted in the Pediatric Intensive Care Unit (PICU) and treated with a dose of valproic acid and adjusted dose of levetiracetam. After 24 hours, the electroencephalogram (EEG) showed a pattern of electrical status, therefore, it was added to the treatment midazolam, topiramate, and phenobarbital. The EEG control showed persistence of the electrical status pattern associated with conscious ness compromise and areflexia, which led to the connection of the patient to mechanical ventilation, and the start of continuous intravenous infusion of midazolam and an increase in the phenobarbital dose (up to 80 mg/kg), without stopping electrical crises identified in a new EEG record. On October 16, the medical team decided to initiate intravenous infusion of propofol in progressive doses up to 10 mg/kg/h, which was main tained for 24 hours, reducing the frequency of electri cal crises. Subsequently, a progressive dose reduction to 5 mg/kg/h was initiated, which triggered the re-ini tiation of the electrical activity with EEG status pattern. On October 17, a simple brain CT scan was per formed, which showed no evidence of cerebral edema or ischemic lesions and no new brain lesions. The next day, ketamine was added in continuous intravenous infusion at 2 mg/kg/h and continued propofol at 5 mg/ kg/h, topiramate, and valproic acid. After the beginning of propofol infusion, the pa tient presented hemodynamic compromise characteri zed by alteration of distal perfusion, tachycardia and arterial hypotension, which was interpreted as septic shock requiring support with two vasoactive drugs (iv adrenaline at 0.3 pg/kg/min and iv noradrenaline at 0.4 pg/kg/min) and first-line antibiotic treatment (ce fotaxime + amikacin) and pan-cultures. In this con text, it was decided to transfer the patient to Carlos Van Buren Hospital as a neurosurgical reference center for assessment and possible surgical resolution of her structural neurological pathology. On admission to the PICU at this hospital, the patient was acutely ill, intubated, with hemodynamic compromise, tachycardia, hypotension, with poor dis tal perfusion, and green urine, supported by the aforementioned vasoactive drugs. Laboratory tests showed metabolic acidosis, increased lactacidemia, and eleva ted CPK and CPK-MB levels. A retrospective review of the clinical tests and findings described before the transfer showed that 24 hours after starting treatment with propofol, the patient presented, along with the he modynamic compromise, an increase in total CPK up to 22,822 U/L associated with metabolic acidosis (pH 7.27 BE:-6.6) and elevated lactacidemia (44 mg/dL). Propofol infusion syndrome was proposed as diagno sis and the administration of the drug was suspended, achieving hemodynamic stabilization after 24 hours, normalizing heart rate, reaching adequate blood pres sure values and improving the signs of distal perfusion (pulse and capillary filling). The control echocardio gram showed no pathological findings. After 48 hours, the support with vasoactive drugs was suspended, whi le antibiotic treatment was suspended after 72 hours with negative cultures, low CRP, and without leuko cytosis, which made it possible to rule out the diagno sis of septic shock suggested in the hospital of origin. A new EEG showed there was no electrical status pattern. A progressive decrease in lactic acid and CPK was achieved, registering a value of 5193 U/L on October 22. 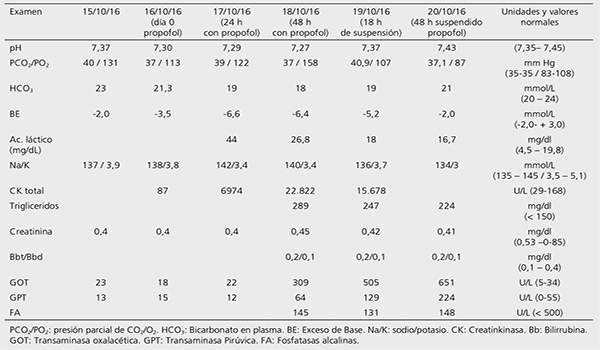 Table 1 shows the results of the laboratory tests and their progression in relation to propofol infusion. Table 1 Laboratory result tests and their relationship with continuous intravenous infusion of propofol. On October 19, brain MRI showed multiple hy perintense lesions of the cerebellar white matter, sub cortical ones, lesions of the corpus callosum and both internal capsules, with magnetic susceptibility artifact associated to multiple bilateral and supratentorial cor tical-subcortical cerebellar microbleeding foci. After the suspension of propofol, the anticonvul sant treatment was adjusted, increasing doses of val proic acid and topiramate, and re-initiating iv mida zolam infusion progressively. The patient had a torpid evolution, and required immunomodulation therapy with methylprednisolone boluses, responding favo rably on the fifth day with recovery of consciousness, achieving extubation on October 26 without difficul ties. Propofol infusion syndrome (PRIS) is a rare and potentially lethal adverse reaction described by the use of this drug in continuous intravenous infusion in high doses. As a result of the widespread use of propofol, cases of metabolic acidosis without other identifiable causes have been reported. The first cases were documented in the pediatric population5-8 since 1990 and later in the adult population9,10. In 1998, PRIS was re cognized as a diagnostic entity by Bray RJ11 through a collection of cases within the pediatric population in intensive care units (ICU), which is where the greatest number of publications appear, however, there are cases described in other areas such as anesthesiology, such as the report of a clinical case of PRIS in an adult patient after an intraoperative high-dose propofol infusion for a short period of time12. Due to case reports in 2001 and mainly motivated by the collection of adult PRIS cases published in The Lancet by Cremer (10), the Food and Drug Administration (FDA)4 warns of the risks of long-term seda tion (> 48 h) with propofol. In 2006 the FDA again up dated the label information and limited the maximum iv dose of propofol to 4 mg/kg/h4. There are currently no unified criteria for the diag nosis of this syndrome, which is based on the combination of metabolic acidosis, rhabdomyolysis, hyperkalemia, hepatomegaly, renal failure, hyperlipidemia, arr hythmias, and rapidly progressive heart failure4. The occurrence of at least one of these signs in a patient who is receiving continuous high-dose propofol infu sion should raise suspicion of this complication. In the case described, propofol was used as a third line treatment for refractory status epilepticus which was difficult to manage. The choice of propofol or other anesthetics in these situations is not without controversy since the evidence is based primarily on case reports and small series, the therapeutic decision is usually made based on the experience of the medical team in charge13. It is important to consider that in refractory status epilepticus, the doses of propofol reported to stop seizures tend to far exceed the recommen ded doses of 4 mg/kg/h14,15 in an average time limit of 48 hours4. These two factors (dose and time) have been identified in the different publications as the main risk factors for developing adverse effects to propofol and PRIS11. In the case of this patient, the electrical crisis was stopped only when 10 mg/kg/h of iv propofol was reached, a dose that was maintained for 24 hours after which it was reduced to 5 mg/kg/h in the following 36 hours. In addition, other risk factors for the development of PRIS have been described, such as the presence of upper respiratory infection, traumatic brain injury, use of corticoids, catecholamine infusions, congenital errors of mitochondrial fatty-acid oxidation, among others16. The presence of severe traumatic brain in jury has been associated with an increased incidence of PRIS due to elevated levels of endogenous catechola mines and exogenous administration of these drugs17. Patients with refractory status epilepticus are conside red a population at risk due to the treatment required (propofol infusion at high doses and prolonged time) which, along with the presence of risk factors that all critical patients have in common (low carbohydrate reserve and high endogenous catecholamine dischar ge), makes them a group that requires special attention in the presence of any manifestation of PRIS. They are explained by the similarity between coen zyme Q and propofol. The latter interferes with the respiratory chain generate a decoupling in the forma tion of ATP18,19, producing an imbalance between the supply and the energy demand. The alteration of beta-oxidation is the main effect of propofol on lipid metabolism. This leads to an ener gy imbalance mainly in myocardial and skeletal muscle cells that are highly dependent on critical catecholami ne-mediated lipolysis and beta-oxidation of free fatty acids (FFA). This explains why patients with PRIS have some degree of cardiac and skeletal muscle myocytolysis20. Associated with this, in critical patients as in the case presented above, lipolysis is increased by increa sed sympathetic outflow and high concentrations of cortisol, resulting in an additional increase in free fatty acids, that associated with the alteration on lipid meta bolism, generates a higher accumulation of FFA, which has been shown to have arrhythmogenic properties20. In patients with critical illnesses, such as those with refractory status epilepticus, carbohydrate reserves are generally low or may even be depleted by high intake or insufficient supply. In the absence of carbohydrates, phosphorylated citrate levels fall and lipid metabolism slows down. Carbohydrate reserves deplete faster in children than in adults, which may explain the higher prevalence of PRIS in this population. If a propofol in fusion is added to this, triglyceride accumulation will begin quickly21. Table 2 shows the clinical correlation of each phy- siopathological event. Table 2 Clinical manifestations and their correlation with pathophysiological events. Understanding the multiple physiopathological factors involved, it is not surprising that the clinical manifestations are variable what makes diagnosis even more difficult. In this case, the initial manifestation was metabolic acidosis and consequently heart failu re determined by hemodynamic compromise. Among the other manifestations described are hypertriglyceri demia, which in this patient rose to 320mg/L, hyperkalemia, and renal failure, among others. It is important to point out that within the cardiovascular manifes tations of PRIS, there is a compromise of myocardial contractility due to beta receptor antagonism, a direct energy crisis due to the low mitochondrial ATP pro- duction22. On an electrical level, in more severe cases, acute bradycardia, and refractory ventricular arrhyth mias that may progress to asystole may occur23. In this patient, it was not possible to evidence echocardiographic or electrocardiographic alteration during the administration of propofol since the medication was suspended on admission to Carlos Van Buren Hospital and these tests were not performed in the hospital of origin. Patients with refractory epileptic seizures receive a large number of antiepileptic drugs for their management, making them susceptible to pharmacological interactions, which was in the case analyzed the asso ciation of valproic acid and propofol one of many to consider. A synergistic anticonvulsant effect between the two drugs is proposed partly because of their di verse action on gamma-aminobutyric acid (GABA) receptors and the inhibition of glutamate NMDA re ceptors of valproate. However, this phenomenon be comes more complex to explain in cases of refractory status epilepticus, since modifications of the GABA re ceptor have been described according to the subtype of unit that constitutes it24. At the same time, it is possible to suggest that patients receiving valproic acid could achieve higher plasma doses of propofol than expec ted due to inhibition of cytochrome P450 2C9 and the enzymatic system UDP-Glucuronosyltransferase by valproate, leading to a decrease in propofol metabo lism. In the literature there are no case reports of PRIS in which the simultaneous administration of propofol and valproic acid is analyzed, however, it seems to be something to be taken into account as a factor that could contribute to the generation of adverse effects and/or PRIS25. As for any other anesthetic used in refractory sta tus epilepticus, it is recommended to administer the lowest effective dose of propofol, titrated according to the response of electroencephalographic monitoring (continuous or serial)2, in other words, increasing the dose of the drug until the desired effect is obtained or until adverse effects such as hypotension and/or car diorespiratory depression are detected that lead to suspicion of the presence of PRIS, forcing the suspension or change of therapy as has been described in up to 6% of the cases described in the literatura26. In relation to the imaging findings, there is a pe diatric case of PRIS in which alterations were reported in the brain MRI, characterized by an extensive hyper intensity in T2 of the supra and infratentorial white matter, with restriction of diffusion and complete re gression in follow-up, with defects in the beta-oxida tion of very long-chain fatty acids as a mechanism27. This differs from what was found in our patient, since multiple infra and supratentorial bleeding foci was ob served in the patient, which persist as small areas of magnetic susceptibility artifact, suggesting a hemosi derin deposition of residual nature. In the clinical con text of severely ill patients hospitalized in ICU, similar findings have been reported, but of lesser extension in relation to the use of extracorporeal membrane oxygenation (ECMO)(32’33), heat stroke34,35 and, as in our case, in relation to refractory epileptic status35, suggesting as physiopathology an alteration of the blood-brain ba rrier secondary to the crises themselves, inflammation or angiogenesis. Considering the clinical evolution of the patient in relation to PRIS, the larger extension of the bleeding foci in relation to what has been reported in literature, as well as the little recognition of micro bleeds as a finding in post convulsive changes36, makes it possible to propose the probable multifactorial ori gin of the alterations in our case. There is no specific treatment for PRIS, it is recom mended to establish a support therapy associated with the suspension of the drug as in this case. Regarding the physiopathological role of carbohydrates, it has been recommended to maintain an optimal intake of carbohydrates (6-8 mg/kg/min) in order to provide an adequate substrate for defective mitochondria and suppress lipid oxidation27. Exceptionally, the use of plasmapheresis33 has been documented to be effective, however, there is no evidence to support its routine use, as the use of renal re placement therapy and ECMO34. On the other hand, it is important to mention that due to the national reality, patients with com plex pathologies are often transferred to other services within the same health care center, and then to others of greater complexity, thus, the transfer of information on the use of drugs and doses used should be very rigorous in order to not delay the diagnosis of cases such as PRIS, in which suspicion and early management are key to avoiding outcomes that could be fatal. The diagnosis of propofol infusion syndrome re mains complex due to the severity of the patients who receive this drug. This clinical case illustrates the diversity of scenarios in which the syndrome may appear, with particular emphasis on patients with refractory status epilepticus, who due to the difficulty in their management require multiple drugs and among them may require propofol in doses that often exceed those recommended, which requires continuous monitoring and maintaining a high degree of suspicion of the appearance of symptoms and early signs of PRIS. Human Beings and animals protection: Disclosure the authors state that the procedures were followed according to the Declaration of Helsinki and the World Medical Association regarding human experimenta tion developed for the medical community. Rights to privacy and informed consent: The authors have obtained the informed consent of the patients and/or subjects referred to in the article. This docu ment is in the possession of the correspondence author. Financial Disclosure: Authors state that no economic support has been asso ciated with the present study. Conflicts of Interest: Authors declare no conflict of interest regarding the present study.